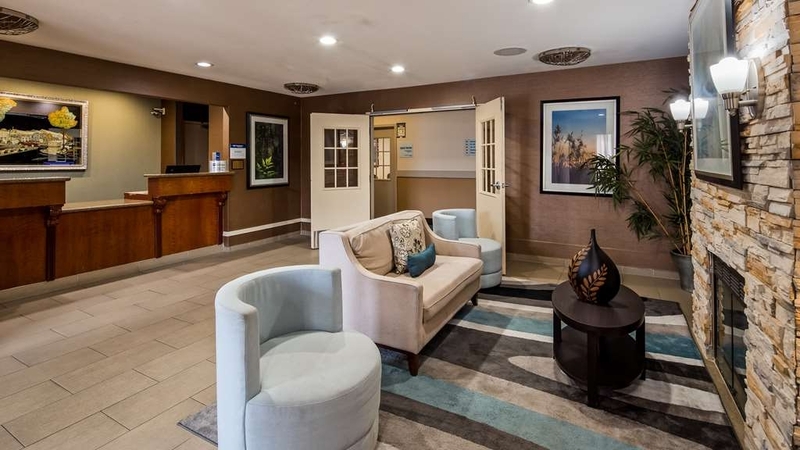 El Best Western Brentwood Inn se encuentra en el centro de Brentwood. Venga y disfrute de las mejores atracciónes turísticas cerca de nuestro hotel. Precios bajos garantizados y ofertas exclusivas. 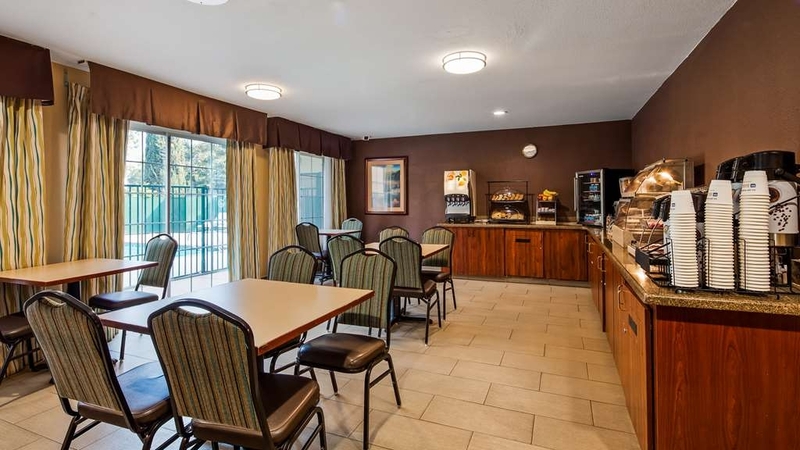 Tanto si se encuentra en viaje de placer como de negocios en Brentwood, el Best Western® Brentwood Inn le ofrece un acogedor espacio para su estancia. Si lo suyo es el golf, los deportes acuáticos o la pesca, el Best Western® Brentwood Inn es la opción idónea para visitar la región del delta del río San Joaquín. Disfrute de ilimitadas opciones de pesca, paseos en barco y deportes acuáticos, para luego acceder a la mayor relajación en nuestras instalaciones. El Best Western® Brentwood Inn está situado a solo unos kilómetros de Discovery Bay, Oakley y Antioch. Nuestro hotel se encuentra a solo unas horas en auto de Oakland, San Francisco, Sacramento y las regiones vinícolas de Livermore y Napa Valley. Comience su día de la mejor forma con nuestro desayuno caliente completo gratuito. Tras un día de diversión y actividades de ocio, relájese en una de nuestras amplias habitaciones con acceso gratuito a Internet de alta velocidad para mantenerse conectado en todo momento y siéntase como en casa en nuestras camas con lujosas sábanas. Tome un baño en nuestra refrescante piscina al aire libre o visite nuestro cómodo centro deportivo. 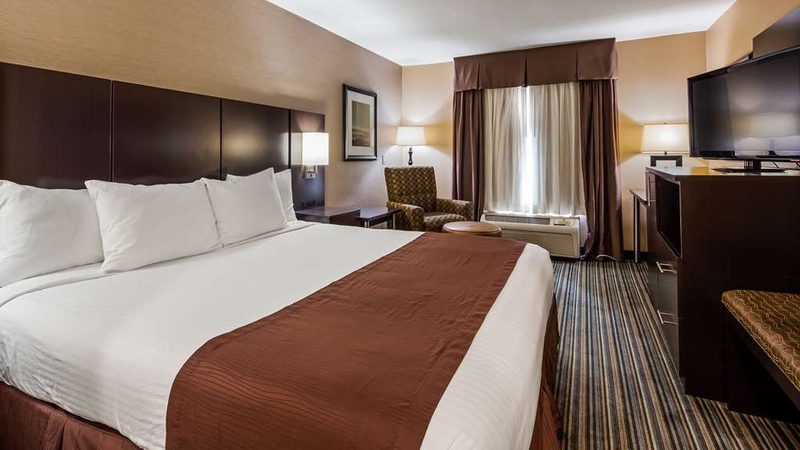 Nuestro agradable personal estará encantado de darle la bienvenida al Best Western® Brentwood Inn. "Slow check-in and room had odd smell"
Arrived on a Sunday a little after 2:00 pm. The hotel looked deserted and in fact we waited at the front counter for over 5 min before anyone showed up to help us. We had to wait they said about an hour for our room even though they knew we were coming and there appeared to be hardly anyone staying at the hotel (parking lot empty). Once we got into our room, the room had a funky odor even though they said they are smoke free hotel. We found the hotel to be very noisy as we could hear every step the people above did along with next door voices and TV sound. I do like the low price and I am sure you get what you pay for. "Good Place to Stay for a few nights"
This place was quite, Staff is friendly. We were only there for an overnight stay. We would stay again. We were staying overnight for a party. The soda vending machine was not working. Also the tub had hair in it. I did not have time to call before we had to leave for the party. The next morning when I went to take a bath and use the jets the jets were spraying over the tub and needed adjustment. Also the water looked dirty. I again did not have time to call and complain as we needed to get on the road. I did call later to complain. The good news is the beds are comfortable. The breakfast was decent. The place is not noisy. Easy to find. We stayed at the Best Western for a wedding, the rooms were okay showing it's age needs some updating. The reading lights had no shades just light bulbs. I went down to breakfast a half hour before closing and there was nothing left, not even coffee. I had reserved several rooms for this occasion for family, I asked if we could get a discount, I was told by the gentleman I was speaking with did not have authority to do that. The most disturbing was when I was told that my sister's room had cockroaches in it. She showed the picture of it and asked for an adjustment in her room charge, the person at the desk said he would request a refund to the manager. The request was denied. It's too bad the manager felt it was not an issue. Until this place is cleaned up I will never stay here nor will I refer this hotel. No wonder they had rooms available and the other hotels in town were full. Location close to all in Brentwood, room very good very clean & thermostats for a/c & heat, staff very good, breakfast was normal same items as always. Price was a little high compared to other rural area hotels, overall good experience. "A good choice for a short stay." 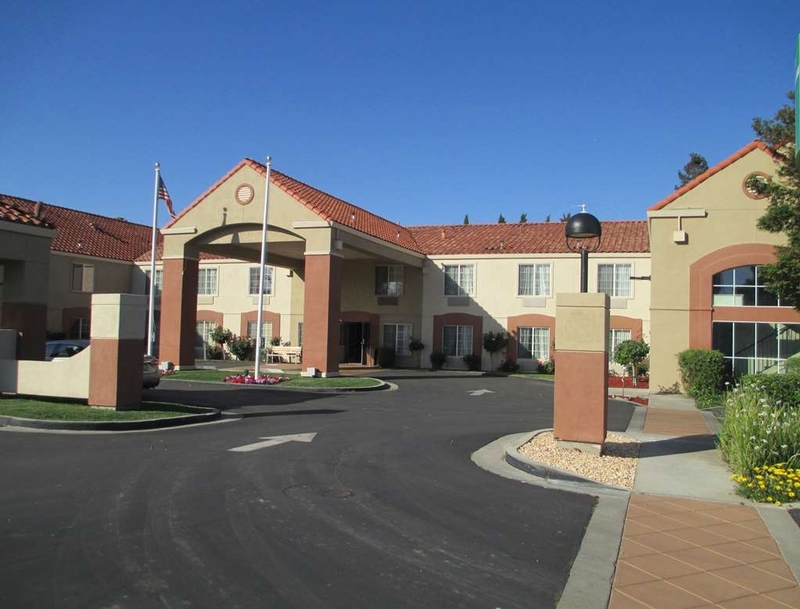 The Best Western Brentwood Inn is an older hotel and is showing its age. But it is clean and the rooms comfortable. The included breakfast is good but did not have the variety we have come to expect from other hotels in this price range. The towel rack in the bathroom fell off the wall shourtly after we arrived on Saturday. I reported the problem to the front desk and was told the maintanance man would not be available until Monday. This responce was unexpected and unacceptable considering the excellet reputation of the Comfort Inn brand. I was in need of a place to stay over night to participate in the Discovery Bay Triathlon the next morning and found the Brentwood Inn on Trip Advisor. Great over night stay, staff was excellent, room was as good as any room could be. 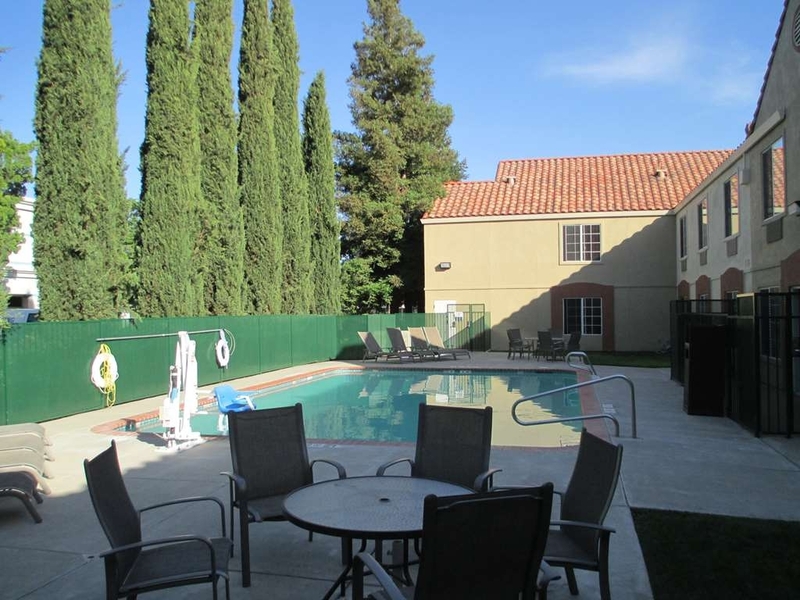 "Inexpensive, very clean, pleasant and convenient"
Playing in a tournament in Oakley, CA. This was one of the closest hotels and it turned out to be really nice for the price. It's a 3-star place but felt like 5 stars. Asked for a jetted tub, and it worked. On 1st floor and I could see my car outside the window, which was nice. This is not a scenic area, so really no need for view windows. Room was large, had a nice desk and good enough free wifi. Very clean!! Bed was great, everything looked almost new. One feature I really liked was the corner lamp and a ceiling light in the bathroom had very low led night lights . . . not enough to keep you awake, just enough if you had to get up during the night. Breakfast was good, scrambled eggs that weren't overcooked . . . had everything for a complete breakfast. Very clean, décor was very inviting, the bed was very comfortable. The desk was very spacious but the chair at the desk was too low. Parking was a bit tight for a large SUV or truck. Overall it was a good stay and I would do it again. Had no problems. Was nice and quiet. Overall place was old and not that nice. Area had a lot of homeless people hanging around but they didn't make any problems. For the price I would say that for the area it's not that bad. "Didn't get what I asked for"
Snippy front desk staff, did not supply handicap room as requested. Room was not as clean as expected. Front desk said the handicap room I requested with my online check in was only available if you call the hotel to make your reservation. When I asked who I could speak to for help or some sort of compensation, she said someone would be in a 11 pm and she would have that person call me. When we checked out, she handed me a card of someone that might help. I felt very unimportant also very tired from trying to navigate a room that did not help with my health needs. Hello, The reservation that you made came in our system as a king size bed and that is what we honored. 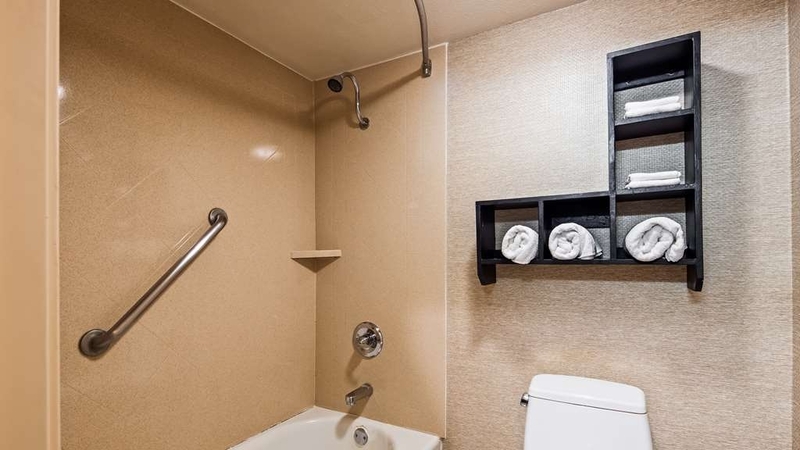 We did see the request for the room to be changed to a handicap accessible, however that room was not available during your stay dates. I do apologize for any inconvenience that you experienced during your stay. 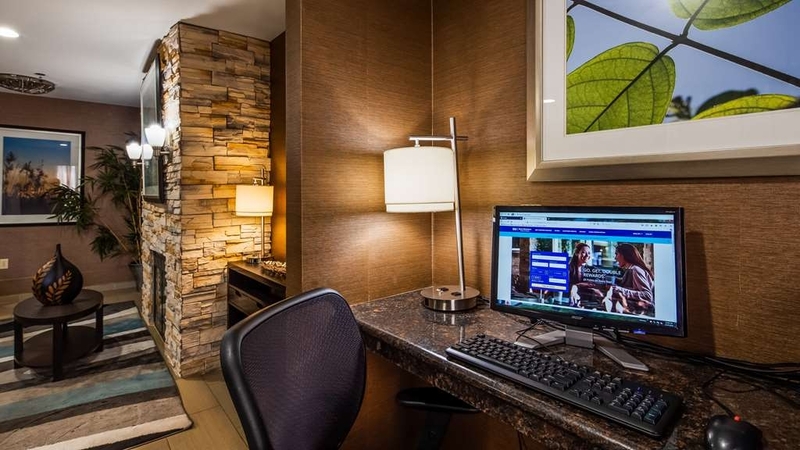 When making reservations, it is always best to make them directly with the hotel or the hotel website, www.bestwestern.com. Only the room types available during the stay dates will populate. I will bring your other concerns to the staffs attention. Thank you. "Marriott price, Motel 6 experience"
Following the directions to the place, I overshot the driveway in and had to circle around the block again. Once I was in the lot, it wasn't clear where the main entrance was located. The room was nothing special and it really doesn't have much to offer. I recently stayed a few nights while my home was being renovated. This hotel is older, not very clean, but the worst part of the stay was with the new recreational marijuana laws, people smoke outside then come back into the hotel. The hotel smelled like marijuana and the hotel staff can't do much about it. "Do not be fooled it is a Holiday Inn Express"
This hotel was a BW take over. Has not been updated, no amenities, filthy rooms, rude staff, bad location. They put a Best Western Logo out front that is it, the old Holiday Inn Express inn is still in the back of the lot. Cold Coffee in lobby. Do not waste your money or time in this hotel. It is not to Best Western Standards. This is the second time we've stayed here. 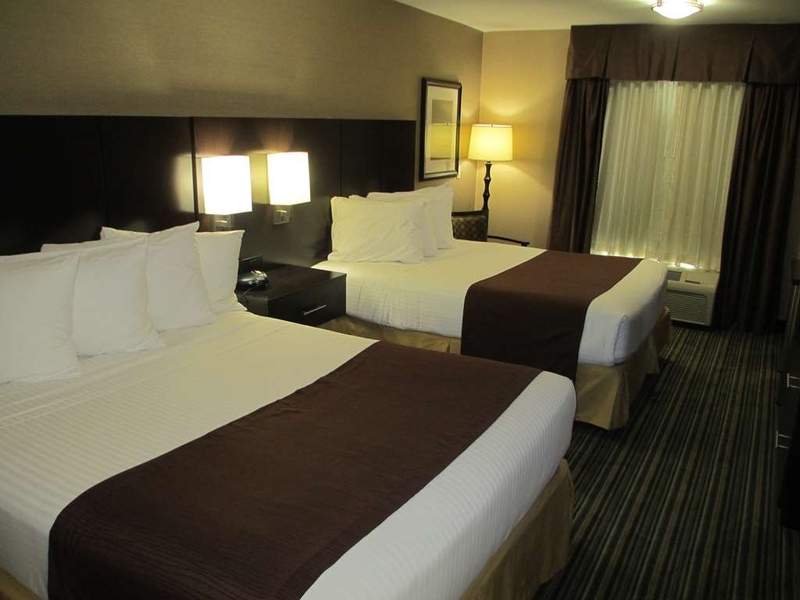 The rooms are clean, the staff is polite and professional, and the bed is super comfy! We both enjoyed the breakfast and the great room was very clean. It's a little out of the way but we didn't mind. Our room was clean and quiet. While the room was not spacious it was adequate. They offer a full buffet breakfast and the variety was good. The bed was quite comfortable and the bedding was excellent. I booked a 5 night stay at this hotel, at third day we informed the hotel we need to check out one day early and was told no problem just talk to Expedia since we paid Expedia the whole amount when we booked this hotel. We called Expedia and told them about this, Expedia then said no problem, they will contact the hotel and process the refund. 2 days later, we got an answer, the hotel REFUSE to refund us for the one night. We did inform them more than 24 hours before, even if you charge for no call or no show the cancellation policy is 4PM a day before, we told them 2 days before our original check out date, the Hotel still refuse to refund the money. It is totally unacceptable. Long store short, be aware of this Hotel, it is totally a Rip Off Hotel. The worst experience I have ever dealt with a Hotel. I will NEVER book this hotel again although we have a on going project 10 minutes away, I will rather go somewhere else even if it is further. Beware! they will charge way over the rate of you reservation. Your fridge wont work or it will be unplugged. Only warm water, and perhaps a sink drain problem. Do not stay at this hotel or in Brentwood. Same owner for all three hotels. 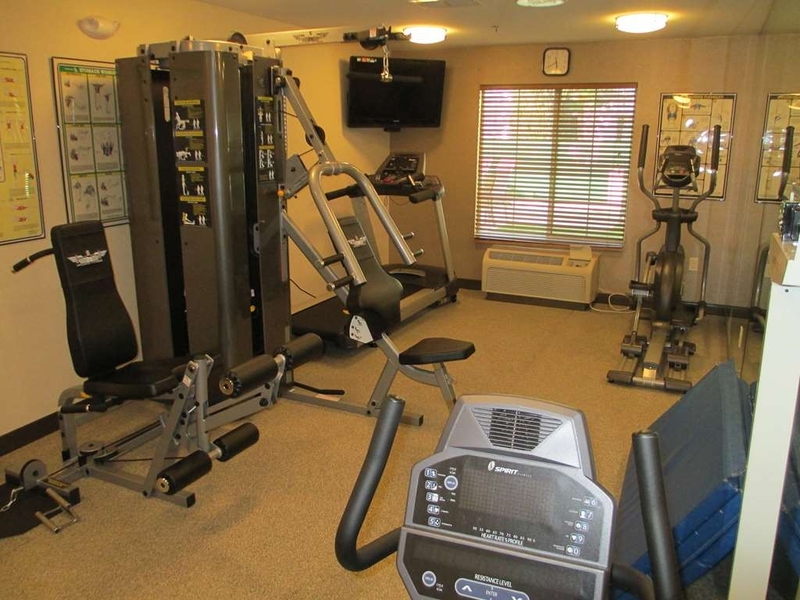 This hotel was in a convenient location, had wonderful, caring,employees who went out of their way to be cheerful and helpful, extensive variety of breakfast choices, nice fitness equipment, & comfortable rooms. We plan to stay here again in the future. "Very good small town hotel"
After staying at many motels and hotels in the US the last weeks and with door into the room directly from outside, it was nice to have a room with a door to a hotel corridor. Large , clean and comfortable room and beds. OK breakfast buffet. Pre registering online was easy on the website, check in took about 1 minute. Room was spotless and comfortable. Fitness room was lacking weights but i suppose its more than enough for the average customer. Check out and customer service was excellent! Well done best western, you have my long term business! We were in Brentwood visiting family for an eight night stay. Our room was very clean and our only complaint was the fan in the bathroom was jet engine loud and the air conditioner was pretty loud too. When the air was on, we didn't hear any outside noise, so it had it's benefits. The staff was helpful and the hotel seemed very busy. Breakfast was good with a lot of options and very attentive attendant. She kept things filled up and the tables clean after use. It was a comfortable stay for us. Thank you for the bottled water in our room every day. Safe quiet location. A few minor problems in room with the AC and phones. Other than that, fair price, clean and comfortable. Internet worked fine however cell reception in this area is poor if you have att&t. I will stay here again. I'm guessing this is a "new" Best Western in town as the old Holiday Inn signs were dumped in the corner of the parking lot. I hope they figure things out and fix up the whole hotel. The room smelled like cigarettes even though it said it was a non smoking room and non smoking facility. My TV didn't work but I didn't say anything because after spending 30 minutes trying to fix it I decided to just go to bed. There was a barking dog a few doors down but once I turned my air conditioner on it drowned out the noise. And last but not least I saw the mold on the windowsill the next morning when I opened the window to get some sunlight in. After all that I didn't even want to check out their free breakfast, I just wanted out and went the .3 mile down the street to Starbucks. Check in/out was nice and fast, other parts of the hotel like the lobby was nice but as a Platinum member it was not up to the standards I expect from a BW. "Great hotel, poor mgmt follow through"
Stay was great, but left behind a swimsuit. Manager supposed to contact us and return asap, but did not until 3 days later. Never received a phone call to let us know and to express thanks, but was left disappointed in him. 2 Queen Bed, non-smoking. After checking and then straight to bed since we are so tired...I turned on the old school A/C....woke up in the middle of the night and found out the the A/C is broken and just blowing hot air. Found this out around 2am so no one slept and too late to change rooms now. Also, the fridge is missing, lamp shade missing, pillows were dirty, bathroom lock is broken etc. We used to go book our room here many times and it was great before. We tried to complain to the attendant and she just brushed as off and told us to call the general manager. We called and it was the same number as the hotel and told us he is not in. Very bad. "Just right for the price"
Put it this way, before I left the hotel, I reserved another nights stay. The value I got for what I paid was better than I anticipated. As long as I can keep getting the rate I just paid, I will be back often. I got much needed sleep, shows on "TV" were pretty good. There was a clean swimming pool. Air-conditioner worked great. The hotel was a converted Holiday Inn Express where we had stayed before. It was convenient to our planned outing and the service and amenities were adequate for the price. That's all I've got for now. We needed a quick one-night stay in an out of the way place while attending an engagement party. 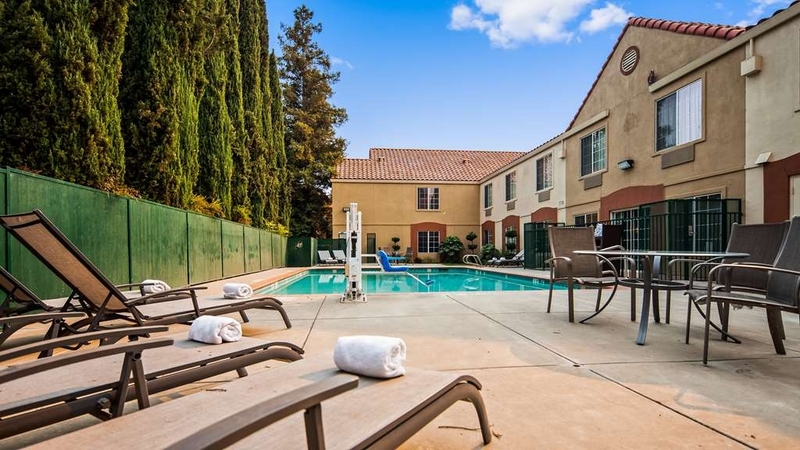 We stumbled upon the Best Western in Brentwood, CA and were pleasantly surprised at what we found. The hotel is small, so getting from the check-out desk to our room, and to the great room where breakfast was served was a snap. The rooms are not overly sized but they are adequate. The hotel was very quiet and clean. I would give it 5 stars but we found the beds to be pretty hard. If you like that, it was a good thing. But we are more softer, snuggly bed type people. Nice pleasant staff. 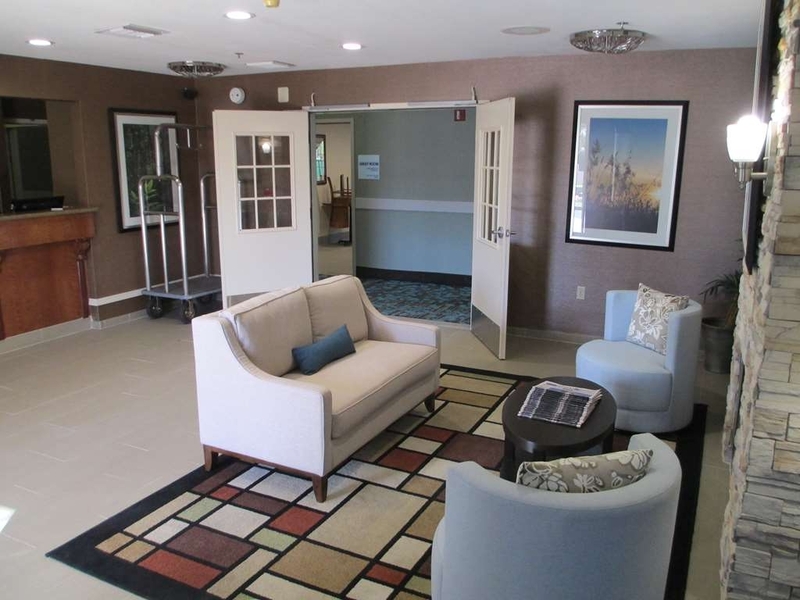 We stayed in Brentwood as we had trouble find a reasonably priced and safe hotel in Concord. The hotel is safe and clean. Easy breakfast. Paid around $150 for a night. No charge for parking They held $100 via credit card for incidentals but dropped over after check out. The beds were very comfortable, A/C took a minute to cool down the room but when we woke up it was nice a crisp just the way I like it when I'm getting ready after a shower. Free hot breakfast and really liked that there was an elevator on the side near the door to the parking lot. Staff was very friendly and helpful. The space was clean, the bed comfortable, the pool was the perfect temp. The breakfast fresh and well presented. Front desk helpfull and easy to work with. Air conditioner worked well. It was 105 outside! "Clean hotel and good breakfast"
This place has been renovated recently. So, the rooms and bathrooms show very little wear and tear which I appreciate. The hotel staff were nice and helpful. They do have some parking spots that will accommodate large RV's or in my case a truck and boat trailer which is also a plus. Hotel is nice on the high end for BWs, I was not really happy with breakfast especially for the money, I expect for the rate items should be stocked & at least have nuts for oatmeal. Bring your own pillows as unless your a big man the pillows will break your neck. Over all the hotel is fairly nice staff were professional & caring. We spent two nights here recently. It just became a Best Western, but the old signs are still behind the building. It appears to be a little worn down, but overall was fine. Only strange problem we had was that the shower water temperature was not adjustable, on and off were your only options. It was set very warm, where it was uncomfortable, but they sent someone right up to adjust it a bit cooler for us. My son ended up getting sick the second night, threw up all over the bed. We collected the sheets/ blankets and put them into the bathtub. My wife went down to see if we could get a clean set, she arrived back with a full clean set, and a trash bag to put the dirty stuff in. Very helpful that night. Rooms were fine, beds were nice and firm, breakfast bar was fully stocked both mornings we were there, and my son loved the automatic pancake maker! Certainly it would be on our list of places to stay if we return there. Not a super nice hotel, it is Best Western, but as nice as I expected it to be. I have stayed here many many times for years. Never had any problems they pretty much have the market conrnered and are a little expensive for what you get granted it is convenient as it is next to harvest park bowl which has a great bar, great people and lots for all to do. Wouldn't recommend this hotel to anyone. Stale food served at breakfast, toilet didn't work and the iron had a white crust on it like someone used way to much starch and they never cleaned it. Glad I noticed before I used it and went to the wedding with nasty stuff on my suit shirt. "The only place I would stay in Brentwood." Our 4 day stay began with a smile and friendly help from the front desk. We landed 8 hrs late from CT and the airlines had lost our luggage. The kind, professional young lady at the front desk helped us with complimentary toiletries. I felt better once inside our hotel. Our room on the first floor was quiet, clean, comfortable. The next day we had to wait in our hotel for the airport to deliver our luggage (the airlines required this). we slipped out fot half an hour and left our cell phone # with the front desk. The airlines called and said they "would be there this afternoon." The 1st shift front desk staff used the hotel's message system to let second shift know we were waiting for our luggage. Great system. We got our bag and everything else was fine. The Breakfast was great.Every BW employee was pleasant and helpful, several above and beyond. Our family has now stayed at the Best Western Brentwood Inn twice for gymnastics competitions in the area. We have been very satisfied with our stay on both visits. The hotel staff is very friendly and attentive. We would certainly return again if in the area. Very pleasant stay with the exception of the towels smelling musty or mildewed. Rooms were clean and neat. Beds were extremely comfortable. would recommend this hotel to anyone interested in staying in this area. Great, high in price. 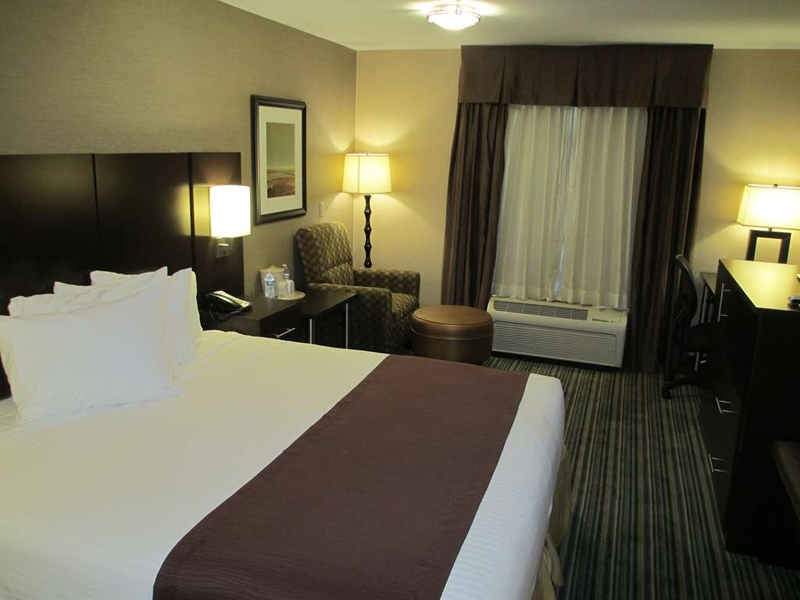 The room was very nice, clean, comfortable and accessories to the room excellent. Enjoyed the stay. The internet and television use was very good. The bathroom was just clean and with handicap access was good. 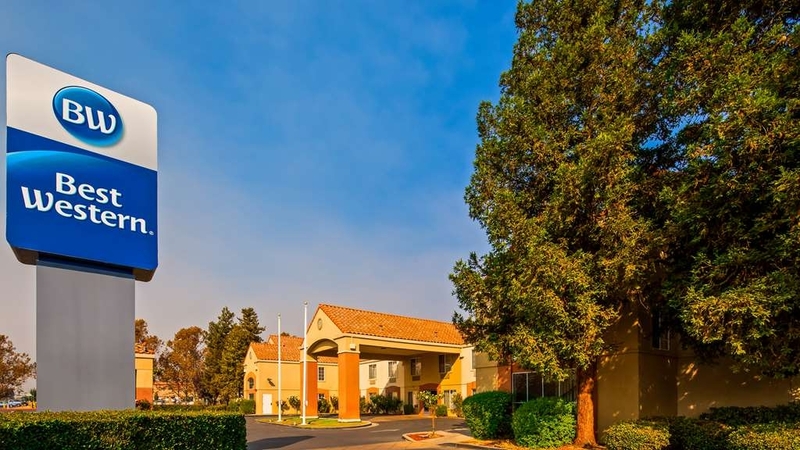 We had to stay only one night but this Best Western Brentwood Inn, Brentwood, CA, is located in the best part of Brentwood. Close to my family for a next visit there. "Quiet, Newer Property, Off the beaten Track!" We had a wedding to attend at nearby Arabella Vineyards and wanted to stay as close as possible. Although there are very few choices in Brentwood, this budget hotel worked out very well. The room was very clean and updated. Breakfast in the morning was more than the continental expected, and the staff was very welcoming. Overall it was a pleasant experience and very conveniently located. You wouldn't think of Brentwood to be a vacation destination, it can be. I was there for work, the grounds and room were very nice, I felt like I was on vacation. Everyone I encountered from the staff were very hospitable. Hotel is not far from Downtown Brentwood which has some really nice restaurants, quaint. A vintage movie theater. And a short drive from the Streets of Brentwood which has some great shopping, and restaurants, too. I would definitely stay there, again. We stayed seven days, complimentary breakfast was the same every morning, which became tiresome. The internet was difficult to log on to and I managed to only log on once during my stay. This was odd as I haven't had issues before and consider myself a fairly competent computer user and thus should have been able to problem solve a connection. The room itself was nice, the bed was comfortable. I don't recommend this hotel to military personnel, there is no discount on weekends or holidays, they refused to honor the on line rates for military after I was guaranteed it when I called about the rates..!!! This used to be a Holiday Inn Express,but now it is a Best Western. Hooray for that. The rooms are beautiful, modern, and clean. The location is excellent, between downtown Brentwood and Discovery Bay. There is a Police Station next door, so it is Very Safe ! This place was a great place to stay. 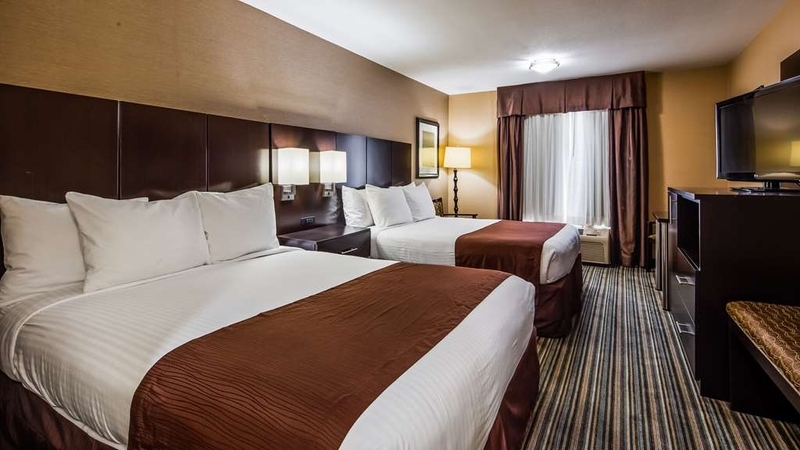 It was quiet, had everything we needed, the beds were comfortable, the rooms had just been remodeled so everything was new and in working order. We would definitely stay here again. It was a great price too! This is a very excellent hotel to stay at, however, they were undergoing upgrade construction that was unfinished, of which was not a bother. I'm sure that the improvements will be very nice and a more contemporary look. 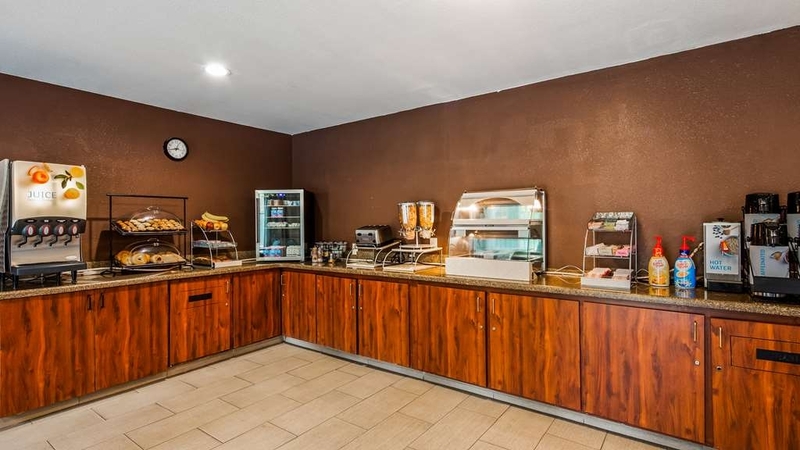 The lobby is very nice as well as the breakfast area of which is larger than most other Best Westerns. This facility used to be a Holiday Inn Express so there is a temporary sign in the front that is Best Western during the day, however, at night the Holiday Inn sign shows and is miss leading. "Smoke Odor and Leaky Sink"
Very disappointed that a non-smoking hotel had rooms with a very strong smoke odor. After seeing two different rooms (both with very strong smoke odor), the front desk attendant gave us room with a leaky sink - we had to use the ice bucket to catch water from the sink pipes. Also, leaky pipe wasn't fixed the next day as promised - had to endure another night counting drops into the ice bucket. On a positive note, the employee were very nice. This hotel was okay. I liked it better when it was a Holiday Inn Express. As a Best Western the staff was nice, the room was clean. It is newly a Best Western so I guess there is a learning curve. The computer didn't have my Best Western number yet. "Dirty, out dated, poor functioning bathroom"
This was one of the worst hotel stay experiences I have had in recent memory. There are so few options in the area but the Hampton Inn in Brentwood is a much better for the same price. It is also outdated and not nice but a lot better than the Holiday Inn. As a Platinum Spire member I was somewhat disappointed in the hotel. The price is reasonable for the area but the property is somewhat wanting. There are no suites, signage inside is not that clear and it is a bit challenging to get around. What exists are dark hallways and one elevator on one side of the building. Wifi is very slow. and disconnects you while on the web - even when located right above the lobby. Staff put me on the Brentwood Blvd side which is a busy, noisy street with trucks - even with the hotel being somewhat set back from the street. There is a small refrigerator in the room. The breakfast is wanting per HIE standards - iovercooked omlettes, undercooked sausages and diminished options. The juice machine dispenses room temperature juice. 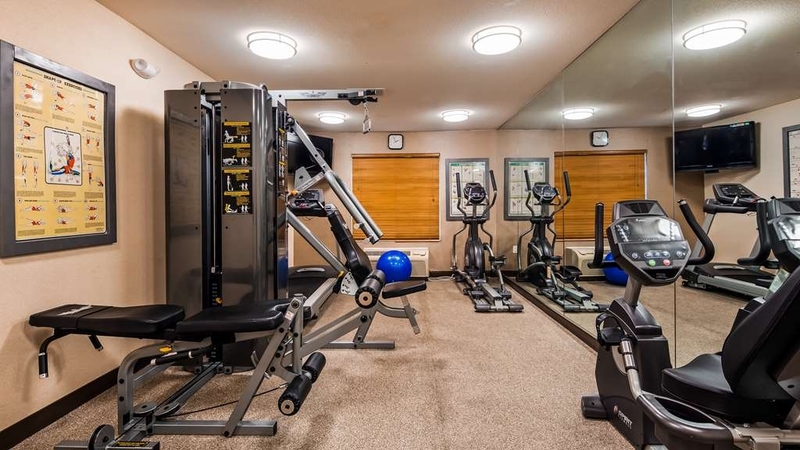 Saving graces include a decent, equipped but small fitness room with weight machine, towels and TV. Front office staff is friendly but housekeeping staff is pretty much unto themselves. Unless I need to save the company money when next traveling in the area, I will look for another property. We spend couple of weeks in this hotel and it was good. staff was friendly. Breakfast was plenty options for kids and adults. Rooms are little small but it has a great tv and bathroom. We had great time but. I recommend to have some social evenings. Pool was clean and big enough. I recommend this hotel! "Consistent with the HIE brand"
I was only in Brentwood to visit a close friend who lives here (I could certainly see no other reason to visit this dustbowl filled with flies, cows, and scorched earth) and really just needed a place to sleep at night. I've yet to have an issue with HIE as they're pretty consistent, and this one was on par. The Good: -Very easy check-in and check-out. -Quiet rooms. -The bed was extremely comfortable with large pillows. The shower had great water pressure. The wi-fi worked well. The Bad: -HIE is known for good "free" breakfast. This location lags behind others. There isn't a waffle maker and the pancake maker was unplugged. Luckily, there was a ton of bacon one day. -The hallways are a little darker and dingier than most other HIE locations. This is very nitpicky, but it's noticeable. The layout is a little confusing, so I suggest just leaving a trail of bread crumbs. If you are unfortunate enough to find yourself vacationing in this super exciting area of California, you could do much worse. It's a good place to lay your head down at night.